Alfonso Jones can't wait to play the role of Hamlet in his school's hip-hop rendition of the classic Shakespearean play. He also wants to let his best friend, Danetta, know how he really feels about her. But as he is buying his first suit, an off-duty police officer mistakes a clothes hanger for a gun, and he shoots Alfonso. When Alfonso wakes up in the afterlife, he's on a ghost train guided by well-known victims of police shootings, who teach him what he needs to know about this subterranean spiritual world. 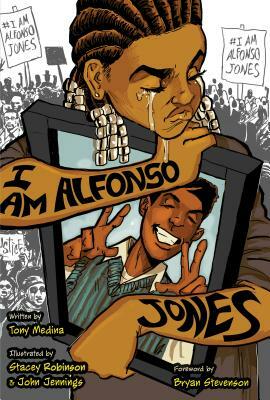 Meanwhile, Alfonso's family and friends struggle with their grief and seek justice for Alfonso in the streets. As they confront their new realities, both Alfonso and those he loves realize the work that lies ahead in the fight for justice. In the first graphic novel for young readers to focus on police brutality and the Black Lives Matter movement, as in Hamlet, the dead shall speak--and the living yield even more surprises.